The Paynesville Area Historical Museum received a $1,500 donation from Bank of the West last week, kicking off a fundraising campaign from local businesses. The society has already rased $20,000 for the community's sesquicentennial this summer. Bank of the West branch manager Shirley Pelz (third from right) handed a $1,500 check to Lois Nehring, treasurer of the Paynesville Area Historical Society last week at the local history museum. 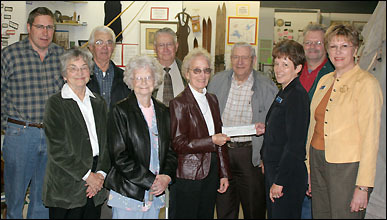 In a fundraising campaign aimed at retiring the museum debt and to prepare for the community sesquicentennial, over $20,000 has been raised so far this year, including the donation by Bank of the West, which will enable the historical society to collect $10,000 in matching pledges from two local donors. Pictured, from left, are historical society board members Paul Bugbee, Rosemary Koshiol, Ellsworth Schultz, Bertha Zniewski, Larry Madden, Nehring, Ralph Fleischhacker, Pelz, Tim Zniewski, and Vicki Jenniges, both a board member and from Bank of the West. Not pictured are board members Jack Bugbee, Tom Haines, and Mike Jacobson. The overall goal of their fund drive is to raise $42,000, said Paul Bugbee, and the Bank of the West donation will kick off the business campaign.